The elephant-ear was historically an uncommon resident of the Mississippi, St. Croix, and Minnesota rivers (Dawley 1947), and for this reason, van der Schalie and van der Schalie (1950) did not consider it to be a normal component of the Mississippi River fauna. Presently, the only known extant population in Minnesota occurs in the lower St. Croix River at Prescott (Kelner and Sietman 2000), and it is on the verge of extirpation from the state. Only 1 other live specimen has been reported from the entire Upper Mississippi River main-stem in recent decades (Illinois Natural History Survey Mollusk Collection). Its extreme rarity and narrow distribution make it vulnerable to catastrophic events. The elephant-ear was originally listed as a special concern species in Minnesota in 1984, but given its extremely limited distribution and concerns over the availability of its fish host, it was reclassified as endangered in 1996. The elephant-ear has a shell that is triangular, thick to heavy, and up to 15 cm (6 in.) long. The outside of the shell is brown to black and is usually rayless. The pseudocardinal and lateral teeth are well developed. The inner shell is usually light purple. Similar species include the spike (Elliptio dilatata) and the mucket (Actinonaias ligamentina), but the spike is more elongate, and the mucket is usually rayed and not as dark, with a white inner shell. 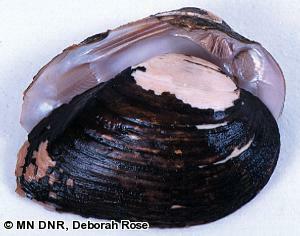 The elephant-ear mussel primarily inhabits large rivers in mud, sand or fine gravel (Cummings and Mayer 1992). Mussels have a complex and distinctive reproductive cycle. Males release sperm into the water, which are drawn in by females through their incurrent siphon. Fertilized eggs are brooded in the female's gills, where they develop into tiny larvae called glochidia. The elephant-ear mussel is tachytictic, with females brooding their young short-term, from June to July, before they are released as glochidia (Baker 1928). Once the glochidia are expelled from the female's gills, they attach to fish gills or fins by clamping onto them with their valves. The glochidia live as parasites on the host fish until they develop into juvenile mussels, at which point they detach from the fish and fall to the streambed as free-living mussels. The primary host fish for the elephant-ear is the skipjack herring (Alosa chrysochloris) (Watters 1994). The primary threats to the continued persistence of the elephant-ear in Minnesota are blockage of its migratory host, the skipjack herring, by dams (Kelner and Sietman 2000), and the species' small population size. It is also threatened by the continuing decline in habitat conditions on the Mississippi River associated with its management as a navigation canal, and by non-point and point source water and sediment pollution. Dams, channelization, and dredging increase siltation and physically alter habitat conditions. The elephant-ear is also being impacted by the infestation of non-native zebra mussels (Dreissena polymorpha) in the Mississippi River and its tributaries. Zebra mussels can attach themselves in large numbers to the shells of native mussels, eventually causing death by suffocation. A 10-year statewide mussel survey initiated by the Minnesota DNR in 1999 resulted in a better understanding of elephant-ear mussel's ecology and current status in Minnesota. Efforts are also underway to propagate juveniles for restocking into areas where habitat conditions have improved. Kelner, D. E., and B. E. Sietman. 2000. Relic populations of the ebony shell, Fusconaia ebena (Bivalvia: Unionidae), in the Upper Mississippi River drainage. Journal of Freshwater Ecology 15(3):371-377.